Featuring Sam Caine and Aaliyah Nitoto from the Bay Area's genre-bending "bluevelvetgrass" string band Three Times Bad, CRITTERS mines the rich history of the folk, blues, bluegrass, honkytonk, gospel, early jazz, and pre-“genre” Americana traditions. 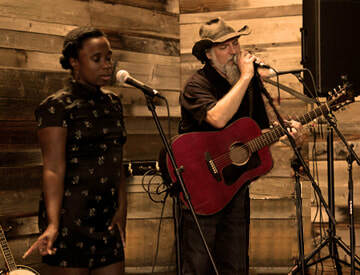 The spinoff duo brings a dynamic, intimate approach to its wide-ranging repertoire of original and old-school "dirty American roots" (the Register-Guard) tunes. Channeling the irrepressible good times of the Devil Makes Three, the communal musicmaking of the Carolina Chocolate Drops, and the innovative/traditional songcraft of Ben Hunter & Joe Seamons, CRITTERS aims to marry the way back with the way forward. You can find them playing up and down the California coast, often with guest artists, including fiddlers Joan Wilson-Rueter or Jean-Pierre Duboucheron and vocalist/kazoo specialist Tricia Patterson.